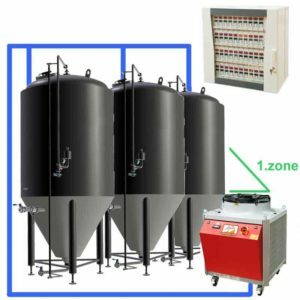 The CFS CC1Z complete fermentation sets are pre-configured sets that include all what is necessary to fermentation, maturation and storaging of beer, cider, wine or similar alcoholic beverages. 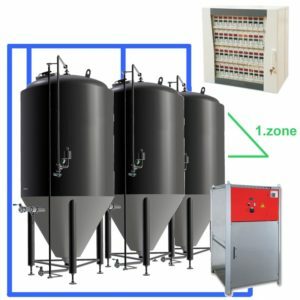 They are equipped with several classical cylindrical-conical tanks, one compact liquid cooler and the central cabinet temperature measuring and regulation system with separated digital regulator for each tank . All digital temperature regulators are placed in the central cabinet on the wall. 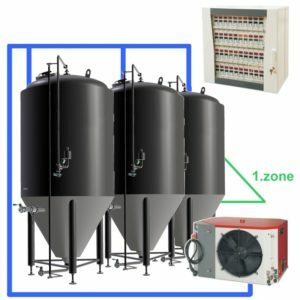 Central cabinet control system + Single cooling zone ( or two dependent connected zones) on each tank. The complete beer fermentation set. This set includes all equipment necessary for professional production of beer using the fermentation and maturation process from wort produced before by the brewhouse. This set is also designed for production of cider from fruit or carbonated wine. Assembling of the set is very easy. The installation does not require any professional workers – there is needed only adequate handling equipment for moving and installation of heavy containers (cylindrical-conical fermenters) on place after delivering of the set. All wires, temperature measuring and regulation equipment (exclude covered central control cabinet and cooler) operate with safety voltage 24V, therefore they can be installed by customer using the installation manual. Therefore the price of the set does not include the installation work.